Blasphemy has joined terrorism as a catchall phrase to intimidate, incarcerate and kill critics and political opponents as well as stifle unfettered debate and settle scores. There is however one difference: terrorism is a justification for curbing freedom of expression often used by governments irrespective of how democratic or undemocratic they may be. Blasphemy serves not only as a tool for governments but has also empowered religious ultra-conservatives, frenzied mobs, and extremist groups and individuals. A four-decade long, massively funded Saudi public diplomacy campaign has created an enabling environment in Muslim majority countries like Pakistan and Bangladesh, where alleged blasphemers and atheists have been kidnapped, abused and sometimes killed in recent months and years. The Saudi campaign was designed to implant Sunni Muslim ultra-conservatism in Muslim communities across the globe as an anti-dote to the faded zeal of revolutionary Iran and position the kingdom rather than the Islamic republic as the dominant power in the Middle East and Muslim world beyond. It has fostered a world of ultra-conservatism that lives its own life often independent of the kingdom. A Saudi court last month sentenced a man to death on charges of blasphemy and atheism. The sentence sparked debate on Twitter with many applauding the sentence. Another Saudi was last year sentenced to ten years in prison and 2,000 lashes for expressing atheist sentiments on social media. Saudi Arabia and other Muslim nations have been lobbying in recent years for the criminalization of blasphemy in international law in a move that would legitimize curbs on free speech and growing Muslim intolerance towards any open discussion of their faith. The kingdom’s ability to further its efforts was enhanced last November when it was elected as a member of the United Nations Human Rights Council. Assertions of blasphemy and terrorism have become favourite terms employed by illiberal, authoritarian and autocratic leaders to crush their opponents. Turkish President Recep Tayyip Erdogan has used terrorism allegations to arrest tens of thousands and fire more than 100,000 civil servants, teachers, professors, journalists, judicial personnel, and police and military officers. In January, persons believed to be associated with security forces kidnapped and abused five Pakistani bloggers critical of the military under the guise of blasphemy. The Pakistani government last month put social media companies like Facebook and Twitter in a bind by demanding that they help identify users so they could be prosecuted on charges of blasphemy that carry the death sentence. The demand was part of a clampdown on blasphemous material on social media. The Saudi public diplomacy effort was frequently enhanced by governments who saw mileage in polishing their religious credentials for politically opportunistic reasons at the cost of building societies that embraced principles of tolerance and pluralism. The result is pervasive intolerance that sparks frequent attacks on minorities. Recent events in Egypt and Pakistan serve as evidence. Writing more than a decade before last month’s attack on two Coptic churches in Egypt that left 43 people dead, Egyptian writer and politician Milad Hanna noted that many of Egypt’s schoolteachers had either worked in Saudi Arabia or been trained at Saudi-funded satellite campuses of Cairo’s Al Azhar University, one of the world’s foremost institutions of Islamic learning. Some of them would separate Muslim and Coptic students in their classrooms to underscore the differences in their religious standing. History lessons would ignore Egypt’s pre-Islamic Coptic heritage, leaving students with the impression that Copts were migrants rather than Egyptians with a history in the country that pre-dated Islam or had been converted to Islam in the 19th century by foreign missionaries. “A belief in the superiority of Muslims...is drummed into Egyptian schoolchildren from their earliest years through the state education system. This is reinforced by unequal laws (the president can only ever be a Muslim, for example) and practice (Copts were long excluded from senior positions in the police, army and even academia),” said Gerard Russell, a former British diplomat and United Nations official, echoing recent Islamist opposition in Indonesia to a Christian being governor of Jakarta. “When I lived in Egypt, back in 1998, Copts made frequent complaints about a ban on new churches or even the repair of existing ones – a prohibition which didn’t seem to apply to mosques. Attacks on Copts in the course of disputes (as opposed to terrorism) would go virtually unpunished. In one appalling example, in al-Kosheh in 1999, 21 Copts and one Muslim were killed; only the killer of the Muslim was ever convicted,” Mr. Russell added. The recent mob killing in Pakistan of 23-year old journalism student Mashal Khan illustrated how unproven blasphemy charges incited mob justice and can be abused by branches of government, local institutions, and individuals to either supress criticism or settle scores. Mr. Khan’s killing was nonetheless a rare instance in which some ultra-conservatives joined liberals in condemning mob justice in a country that has draconic anti-blasphemy laws on its books that date back to the period of British colonial rule and has allowed the killer of a prominent critic of the law to be celebrated. “Mashal Khan’s case was an expression of collective behaviour of extremism, which can be invoked and exploited by interest groups for mala fide intentions. This can also be called the ‘criminal exploitation of extremism’, in which criminals take advantage of the masses’ religious sentiments, knowing that the state and its institutions will hesitate to take action. These attitudes are creating a conducive environment for ultra- and hyper-extremist groups to operate in the vulnerable spaces that exist in every class and institution in Pakistan,” said Pakistani security analyst Mohammad Amir Rana. 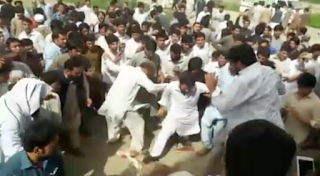 Mr. Khan criticised his university for poor management on local television three days before an angry mob shot him dead and then beat and stomped his bloodied, lifeless body in a frenzy that was filmed and posted online. “The accusation of blasphemy was a tool to inflame sentiment,” said one of Mr. Khan’s teachers. Mr. Khan’s death has sparked debate in Pakistan about an amendment, opposed by Islamists and ultra-conservatives, that would explicitly reiterate the state’s exclusive prerogative to prosecute blasphemy cases. The degree to which ultra-conservatism has fostered violence and intolerance was highlighted two weeks after Mr. Khan’s killing when hundreds of worshipers attacked a man after weekly prayers in Pakistan’s remote northern Chitral region. The mob accused the man of blaspheming in the mosque. Police took him into custody, but people stormed the station house and demanded that he be handed over. Police officials, who said the victim might be mentally impaired, had to use tear gas and fire into the air to disperse the mob. “Mashal Khan was killed because our culture sanctions killing. There is no public agenda for carrying out a war on the inhuman, subversive and barbaric dimensions of our culture exercised through honour killings...tribal feuds and panchayats (local governments ordering gang rapes. Clerics are increasingly issuing edicts against minorities and ‘non-practising Muslims’. The state needs to do better than witnessing it all as a bystander. Otherwise, Pakistan will continue its downward march to Hobbes’s state of nature where people are at each other’s throats,” said scholar Mohammad Waseem. The threat goes beyond Mr. Waseem’s concerns. The threat is the abuse of labels like terrorism and blasphemy by governments; institutions, religious and political groups and individuals alike that creates an environment that not only fosters intolerant violence and disrespect for the other, but also enables vigilantism, extremism and radicalization. It renders the rule of law impotent and legitimizes extra-judicial killings whether by mobs in Pakistan or authorities in the Philippines.